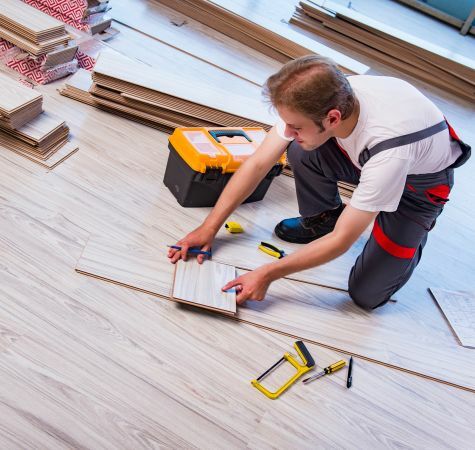 No two of the latest flooring materials require the same methods and Techniques for proper installation. Our professionals know every manufacturer's products. At Fleming Flooring & Design Center, our expert installers are thoroughly trained in the correct methods for the installation of carpet, hardwood, tile, luxury vinyl tile (LVT) and laminate. This is your assurance that your new floor will be stunning to look at, extremely durable and long lasting. Perhaps just as important, we will complete our professional services on schedule and at the best price in our area. We supply flooring materials and top-quality installation for homeowners in Marietta, Cobb, Paulding, Fulton, Cherokee and other nearby Georgia communities. Fleming Flooring & Design Center is totally committed to providing our valued customers with new flooring that meets or even exceeds their expectations. We ensure this by providing inspections before the project begins and again, after it is completed. Our state licensed and insured installation team is trained to precisely follow each manufacturer's specific techniques for their products and they are frequently re-evaluated to be 100% certain that they can do the best work possible. Our team members are also sensitive to completing each project on schedule in order to minimize any inconvenience to family members as well as to leave the area neat, clean and pristine after the new flooring has been installed. We pride ourselves on being installers to our customers, not strangers. We also have experts on hand to help homeowners correctly measure their rooms so that the correct amount of product can be ordered, and to make suggestions that enable each installation project to be completed with minimum stress to family members. Our primary goal, of course, is to give each customer a new flooring installation that will completely satisfy their family. If you would like to know more, please phone us, e-mail us, or drop by our showroom in Marietta, GA to discuss your need for new flooring installation with one of our flooring consultants.